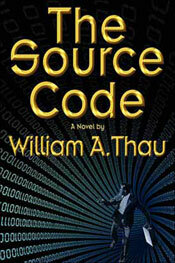 William A. Thau, our classmate novelist, has released his second novel, The Source Code. Sarah Wynter is the director of one of New York's most prestigious art galleries and engaged to one of society's most eligible bachelors. After the unexpected death of her estranged uncle, Sarah becomes the sole beneficiary of $2 billion, and her rational world suddenly turns into one of terror, inhabited by forces of evil unlike those she has ever known. Computer hackers in Bangalore, India, in league with the Russian mafia, use a stolen source code to silently breach the firewalls of her banks' computer networks and steal the $2 billion. Instructions are then given that will end Sarah's life. John Ambrose is one of the top banking attorneys in Virginia. When his identity is stolen by a Columbian drug cartel, he unwittingly gains possession of $385 million of the cartel's money, and his death warrant becomes sealed. Running from the cartel, Ambrose suddenly finds himself alienated from his law firm and the target of a nationwide manhunt. When the stolen source code is used to break into U.S. defense installations, warning bells are sounded at the Department of Homeland Security and the FBI, and the paths of Sarah Wynter and John Ambrose soon cross. In his frantic attempt to stay alive, Ambrose is thrust into a deadly confrontation with the Russian mafia and the Cali drug cartel.